Writing this in Meaux, at breakfast. We rode 6 miles yesterday. 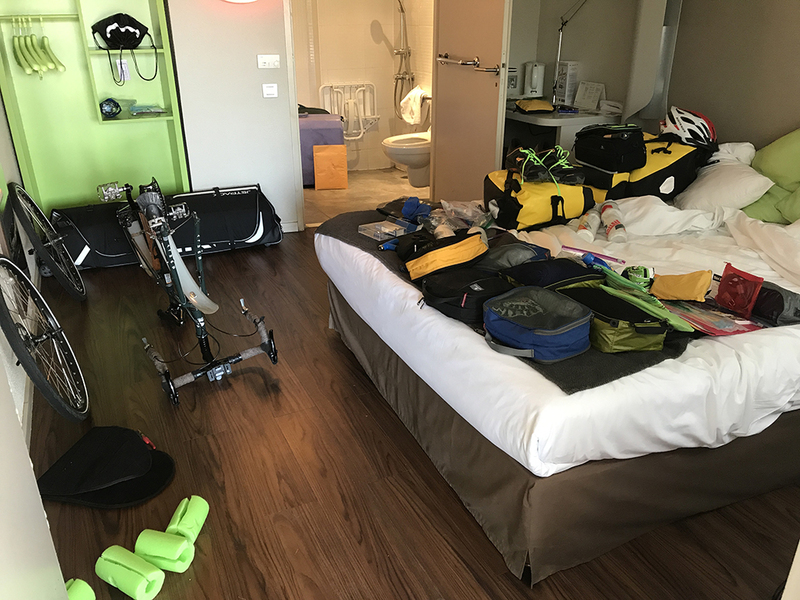 We arrived yesterday with no problems - retrieved our luggage at the airport and were happy to see that the bike bags arrived in oversized luggage as expected. We met our driver, Mr. Tan, outside of the arrivals area. He was holding a cell phone with Steve's name entered on the screen, and of course it was easy for him to recognize us. 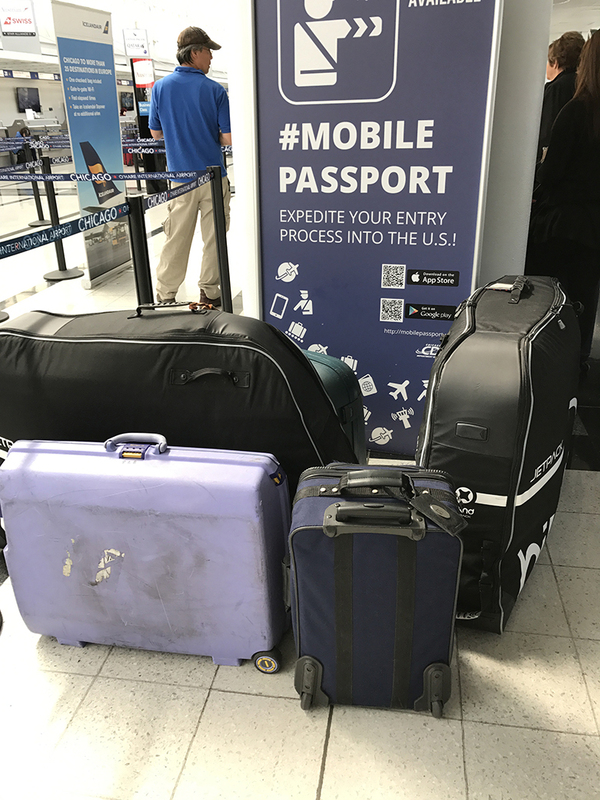 We were towing enormous bike bags, which were attracting attention from passersby, just as they did in the Chicago airport. It was warm and sunny -- maybe around 75 or 80 degrees. It was only a short ride to Meaux, about 40 minutes. 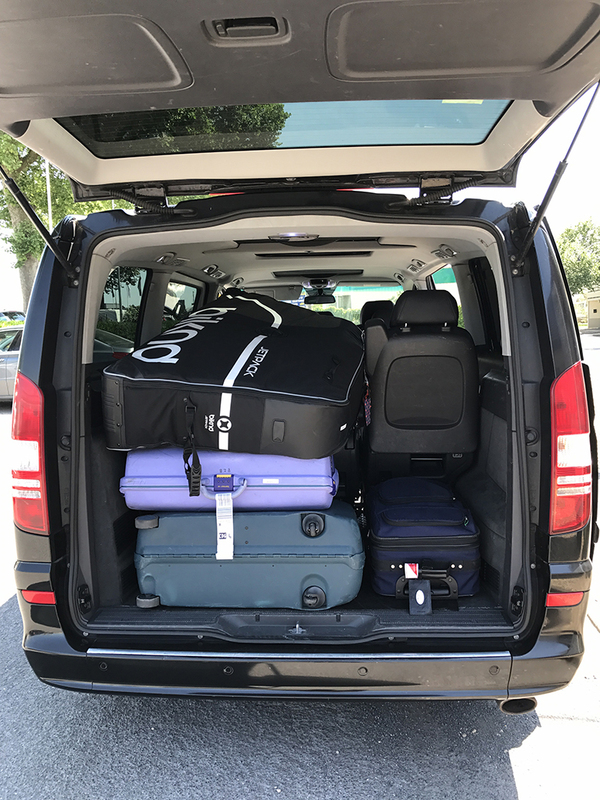 Mr. Tan does not talk much, but he was friendly and helpful, jumping in to help tow our heavy bags through the airport, loading them carefully in his huge Mercedes van, and unloading them for us when we reached the hotel. He had also thoughtfully placed bottles of water in the van, which I gladly opened and drank. He told us that he is the driver who will be meeting us at the end of our trip to transport us back to the airport on the 13th. That was good to know. He seems very professional. 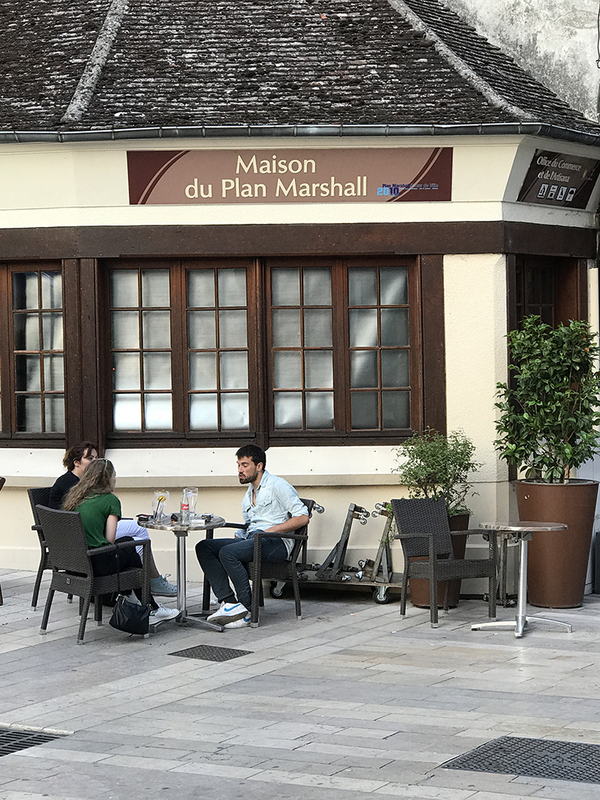 In Meaux, we were able to check in to the hotel (around 12:30 pm) but waited a little less than an hour so we could have a room on the ground level and not have to haul the bags up a staircase. After a short nap (during which I couldn't sleep), we got up and started assembling the bicycles. That took about three hours -- a series of trying to find the right tool or piece, putting it on wrong, trying it again, and getting ourselves thoroughly greasy and sweaty in the process. We finally got everything all arranged more or less to our satisfaction around 6 pm. We had planned to allow plenty of time for this preparation so that we would not feel rushed and pressed to be underway without complete confidence that we had everything we needed. Then we went out for a short ride. 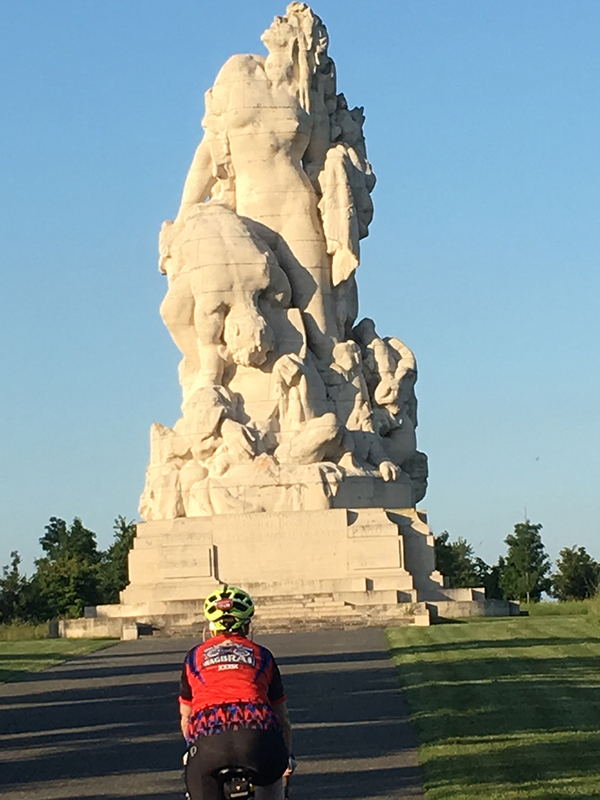 We rode north of our location toward the Museum of the Great War, stopping there to photograph the memorial to the brave soldiers of France who fought the 1914 Battle of the Marne, a huge monument erected in 1932 by the "American Friends of France." The 1914 Battle of the Marne did not include the Americans, but it was crucial in sparing the city of Paris (it is also celebrated by the Parisians with a monument to the citizens of Meaux for saving their city.) The battle included the legendary story of General Joseph Gallieni, who dispached French troops based in Paris by using a fleet of taxi cabs. The Museum of the Great War has a bronze statue of Gen. Gallieni, moved to the museum grounds from a location along a French highway outside of Meaux a few years ago when a farmer discovered that would-be thieves had attempted to cart it away. We arrived at the museum after closing time and could view the statue only from a distance, since it was behind the enclosure of the museum grounds and a guard informed us the museum was "ferme." We hope that when we return to Meaux on the 11th we will have time to give the museum more attention. From the museum, we cycled toward the city center to see the Gothic cathedral of St. Etienne. We tried to follow our pre-routed map and cue sheets, but it was difficult to find clear indications of street names and we resorted to using a live Google maps on Steve's phone instead. This works, but draws the battery down on the phone very quickly. The cathedral was closed, but we admired it from the outside. A fine example of Gothic architecture, and like most Gothic churches built around 600 years ago, in a constant state of repair or cleaning. The left side of the church front had undergone fairly recent work, and its stone was free from the black residue of centuries of time and air pollution. 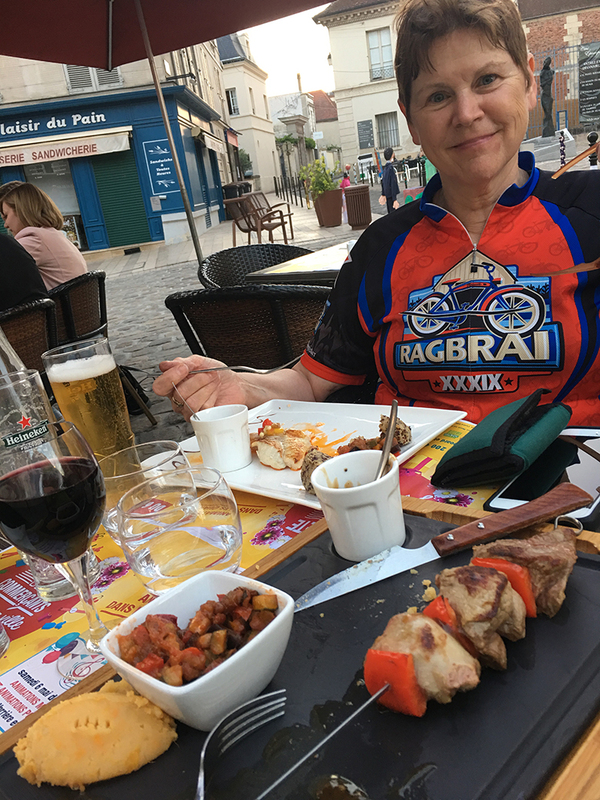 As we walked our bikes in the pedestrian zone, aromas from the cafes wafted up, and we decided that it was dinner time. Though it was after 8 pm, there was still plenty of evening light, and twilight finally came around 10 pm. We enjoyed a fixed-price menu of appetizer, entree and dessert, with wine and beer. Steve choose the beef kabob, and I had the grilled dorade. Both were delicious. His appetizer of melon and prosciutto looked scrumptious, and mine -- a "trilogy" of tomatoes, with mozzarella, pesto, and balsamic glaze -- was heavenly. For dessert, we each chose Brie de Meax, which was delivered with fresh walnuts and a few greens. The two modest slices of brie were so rich and creamy that they more than accomplished their task. Around 10:30 pm, we pulled our bikes away from the cafe and started through the back streets toward the hotel. Traffic was light, but a few cars were lined up behind us in the one-lane streets as we pedaled along with our headlights and taillights fully lit. We soon found a wide spot to let them pass, and it was not long before we were on the wider Avenue de Roosevelt and cycling the few blocks to safely reach the hotel. We tidied up a few things in preparation for morning and took showers before falling into bed around midnight. Shuttle drivers don't talk much. Pack your pannier and then divide by two before setting out on your adventure. Brush up on your hotel-room plumbing skills.